For APIs and excipients, materials of several mm size is milled to 10 µm particle size using impact mills is common. The Fine Impact Mill UPZ can easily control the particle size of the milled product and is also easy to disassemble and clean. 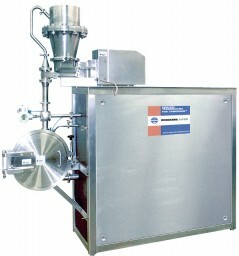 The standard system consistes of a feeder – mill – product collector. 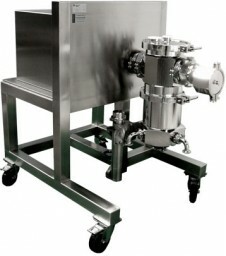 Systems operating with cooled air or inert gas have been delivered and sizes from laboratory to production capacities are in use by many pharmaceutical companies. For poor solubility drugs, increasing bio-availability by milling to particle sizes of several microns increases the specific surface area, which in turn increases the dissolving speed of the drug. 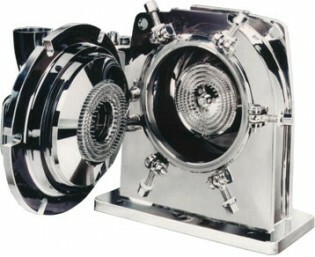 Jet mills are commonly used for this application. There are two types of Jet mill, Spiral Jet Mill AS and Counter Jet Mill AFG. With the Counter Jet Mill AFG, controlling the product particle size can be easily achieved by adjusting the classifier speed, making quality control simple. There is very little build-up of material and wear making the Jet mill suitable to process pharmaceutical ingredients which tend to be very adhesive powders. Milling of API increases the specific surface area and surface energy resulting in an increased potential for dust explosions. Preventive measures such as using inert gas for the milling gas are generally used. 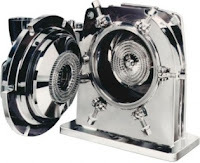 For milling of pharmaceutical ingredients using the Spiral Jet Mill AS or Counter Jet Mill AFG, milling in inert gas in a closed loop circuit or installation in an isolator with an inert gas atmosphere is possible.